Summer in Clark County means warm days outside soaking up the sun that we miss throughout the rest of the year. It also means no school and longer days. With this summertime change of pace, families of all kinds are looking for fun and unique things to do together. Check out this sneak peek of entertainment and fun in store for Southwest Washington families all summer long. Stacey Donovan, special events manager for the City of Vancouver shares that the City will be putting on a variety of exciting activities this year, many of them free of charge, and starting just days after kids are out of school for the summer. “One of our biggest events of the summer is the Recycled Arts Festival in Esther Short Park,” she says. This free event, produced by Clark County Public Health, began in 2005 with a mission to educate Clark County residents about waste reduction, reuse and recycling, and has grown to include entertainment, wares made from recycled materials by a variety of artisans, and resources for environmental awareness. The Recycled Arts Festival, which traditionally takes place the fourth weekend in June, is followed days later by the highly popular fireworks show on Independence Day at Fort Vancouver National Historic Site. These two large events kick off the full summer season, during which the City of Vancouver will continue its tradition of regular outdoor concerts and movies at several different venues around town. 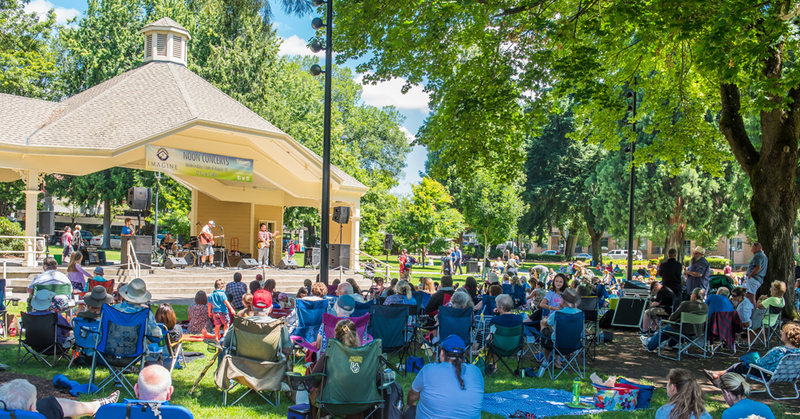 East Vancouver families can enjoy the Columbia Tech Center Sunday Sounds concert series, and Esther Short Park will again host the Imagine Realty Noon Concert Series on Wednesdays and the Riverview Six to Sunset Concert Series on Thursday evenings. Also taking place at Esther Short Park this summer will be the beloved 3 Days of Aloha Hawaiian Festival in July, which Donovan says is a great way to experience Hawaiian food, music and art. July 21 will be a hot one in Vancouver: Fire in the Park, highlighting safety education, and Cruisin’ the Couve, showcasing hot rods from all eras displayed along Main Street, will both happen that day in downtown Vancouver. Families can even enjoy the cosmos at a special family friendly overnight stargazing event inside the historic Fort Vancouver in August, put on by the Parks and Recreation Department and the National Park Service. To read more, pick up a copy of the June 2018 issue at any of these locations, or view the digital archive copy here. For details about these and many more summer events in Southwest Washington, go to our online calendar, where you can search for and view hundreds of local events by name or location. A lifelong resident of the Pacific Northwest, Brooke Strickland is a full time freelance writer who recently co-authored her first book, “Hooked on Games.” When taking a break from writing, she can be found in a cozy chair with a book, or on the Oregon coast with her two daughters, husband, and two dogs.